Sept. 5, 2017 | Sept. 5, 2017 | Maurice Rigsby has been appointed vice chancellor for institutional relations at the University of Arkansas for Medical Sciences (UAMS). Rigsby, an attorney, came to UAMS in 2014 as a government relations liaison and was promoted to assistant vice chancellor. He replaces Cherry Duckett, who retired July 1. Prior to coming to UAMS, Rigsby was the senior assistant attorney general for legislative affairs with the Arkansas attorney general’s office where he managed the attorney general’s policy agenda while working with members of the state Legislature and the governor’s office. 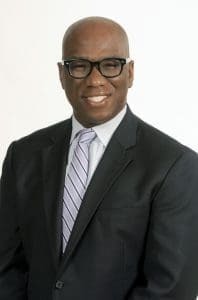 Rigsby has served as the deputy director and regulatory counsel for the Arkansas Oil and Gas Commission, as a staff attorney for the Arkansas Bureau of Legislative Research and as a private attorney in a Pine Bluff law firm. Rigsby graduated from the University of Arkansas at Fayetteville School of Law in 2003. During law school, he worked as a law clerk for Walmart and as an NCAA and Southeastern Conference compliance assistant for the Department of Athletics at the University of Arkansas, Fayetteville.